A homeowner’s entry door is the portal to the family’s daily life, used throughout every day by family and friends. It is the focus of extensive everyday use while acting as a security bulwark against threats throughout all weather extremes. 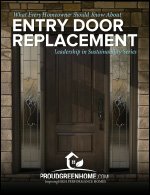 It’s no wonder that when it comes to replacing an entry door several important aspects need to be considered and researched before the purchase.